Starring Craig Warnock, David Rappaport, Kenny Baker, Malcolm Dixon, Mike Edmonds, Tiny Ross, Ralph Richardson, David Warner, Sean Connery, Ian Holm John Cleese, Shelley Duvall, Katherine Helmond, Michael Palin, Peter Vaughan, Jim Broadbent. Now here's a very early Criterion disc - number 37 -- that I missed in the DVD format and had frankly forgotten. Upwards of sixteen years later, it has finally made to the Collection's Blu-ray list. It's time to praise both Terry Gilliam and the production company known as Handmade Films, largely run by ex-Beatle George Harrison. Handmade has an admirable record, if not for big successes, then for films deemed worthy of merit. Harrison and producing partner Denis O'Brien initiated some pictures and rescued a few others when they were abandoned by larger UK producing entities, like Monty Python's The Life of Brian and the superior gangster film The Long Good Friday. In 1981's Time Bandits Handmade put its faith behind filmmaker Terry Gilliam, who was at the time known mainly for interstitial animations for the Monty Python franchise. Gilliam's fanciful visual imagination and eccentric sense of humor transplants well to big-screen fantasy. Time Bandits is original from beginning to end, a delightful children's tale outfitted with a keen sense of adult irony. Made for relative pennies, Gilliam's epic easily outclasses many big-scale fantasies to follow. A significant part of its charm is its delightful art-craft, "handmade" quality -- which makes the Handmade Films logo all the more appropriate. We're told that Terry Gilliam concocted Time Bandits because Handmade couldn't quite handle his concept (or the budget) for the film he really wanted to make, Brazil. But his basic story is a fantasy gem. A group of "The Supreme Being's" workers (in the bushes & shrubbery department) grow weary of their lowly status and purloin the original map of the universe. As it was constructed only in seven days, the fabric of space and time has numerous holes that the argumentative dwarves can exploit to jump to various places in time -- to pull off spectacular robberies. Dwarf gardener Randall (David Rappaport) bosses the others around: "We agreed to have no leader, so shut up and do as I say!" While pursued by the disembodied head of The Supreme Being (Ralph Richardson), the dwarves enlist a willing partner, the lonely, imaginative British schoolboy Kevin (Craig Warnock). Their various adventures include fleecing and being fleeced by such historical luminaries as Napoleon (Ian Holm), Agamemnon (Sean Connery) and Robin Hood (John Cleese). 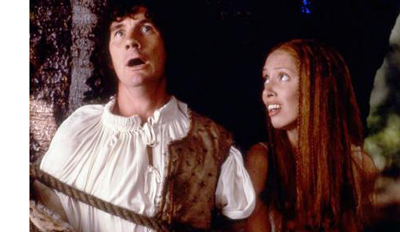 The diminutive bandits also interfere in the love life of the silly-twit sweethearts Vincent and Pansy (Michael Palin & Shelley Duvall), whose romance repeats through the ages -- they appear in Robin Hood's forest as well as on the deck of the Titanic. To evade The Supreme Being, Randall takes his motley gang into the land of magic, hoping to steal a fabulous fortune hidden in the Fortress of Ultimate Darkness. This of course is a trap laid by Evil (David Warner), a self-important demon intent on securing the map of space and time. He'd like nothing better than to usurp The Supreme Being's throne and take control of the universe. The intrepid Time Bandits perform a daring escape, but the highly moral Kevin convinces them that the map must be retrieved at any cost. 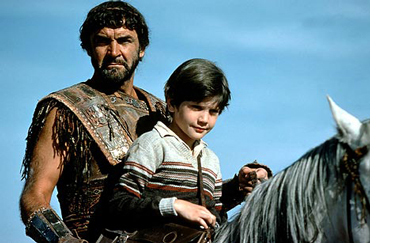 Charged with enthusiastic high spirits, Time Bandits dazzles us with ingenious designs harnessed to solid storytelling. Terry Gilliam and his production designer Milly Burns concoct dozens of clever sets, incorporating miniatures and limited special effects to achieve specific visual aims. A town in Lombardy burns under Napoleon's bombardment -- it's either a well-chosen ruin or a redressed studio set. A real ancient city stands in for Agamemnon's Greece, a pricey bit of location work in Tunisia that makes the film look lavishly expensive (even the light is different). Gilliam's miniature castles, monsters and ships at sea, etc. were clearly designed to fulfill only what was required by the scripted storyboards. One of the most impressive effects is a sailing ship that is revealed to be nothing more than a hat worn by an enormous giant. The colossus emerges dripping from the ocean in slow motion, stomping with ten-league strides across a sandy landscape. Thanks to Gilliam's excellent taste and art direction, the giant is a showstopper. Likewise, a tilt-crane shot up what seems to be an endlessly tall Fortress of Ultimate Darkness turns into a clever "overkill" joke, like the long, long spaceship shot in Star Wars. Entertaining stagecraft and terrific costumes make an enormous contribution to the show's impact -- costume designer Jim Acheson dresses dwarves, heroes and fantastic creatures in a wonderful selection of "lived-in" uniforms and raggedy tunics. A dance performance in Agamemnon's Greece evokes a delight in delicate color and movement. Ancient times, for once, looks like a charming place to live. Viewers have been quick to compare Time Bandits to The Wizard of Oz. The parallels are certainly there -- an odd adventure away from home, a 'wizard' who appears as a floating head, the mission to a forbidding castle to destroy the evil villain within. Kevin falls in with six very un-Munchkin-like dwarves trying their best to be despicable thieves. Strung upside-down by Robin Hood's gang of swarthy thugs, Randall screws up his face to attest to his desire to be a really, really nasty bad guy. Yet we know the bandits are really creampuffs at heart. The heroes encountered by Kevin and his bandits derive from Kevin's daydreams and studies, another Oz-like parallel. But some of them are just as disappointing as Kevin's own parents, a sad pair of consumer zombies obsessed with kitchen appliances. Napoleon is a dolt who loves violent Punch 'n' Judy shows. The condescending Robin Hood smiles with upper-class insincerity as he steals Randall's & Kevin's golden loot. Although the universe is put more or less back in order at the finish, Time Bandits makes wicked fun of the notion of a benevolent paternalistic God. As embodied by Ralph Richardson, The Supreme Being is a sober elitist with no patience for his (admittedly) untrustworthy minions. The bandits' entire jaunt, it turns out, was engineered by TSB to rid himself of another concentration of "pure, undiluted Evil". For Kevin, there's no sign that heaven really cares about him personally. This minor point makes Time Bandits different from most children's fantasies: it doesn't reassure us by reinforcing traditional values. The rather ironic finish back home leaves Kevin's future definitely up in the air. But tragedy is the last thing on our minds, as we're convinced that Kevin will be better off fending for himself anyway. He's a great kid with a natural sense of morality. The film's one character not lampooned is Sean Connery's Agamemnon. The Greek king plays straight with Kevin. He smites wicked monsters, dispenses justice with a fair hand and laughs at simple entertainment like a child. Kevin probably doesn't want to be stuck back in the ignorance and pestilence of the B.C. world, but Agamemnon is ideal as an adoptive father. Young children that see Time Bandits instantly love Sean Connery. 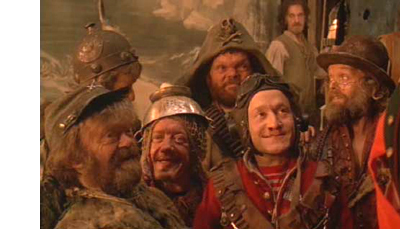 A substantial success in the United States, Time Bandits launched Terry Gilliam on the road to bigger things. He got to make his dream project Brazil but also suffered his ill-fated run-ins with what he termed "the hamster factor", a creeping tendency for his complex productions to go wrong in unpredictable ways. Brazil and The Adventures of Baron Munchausen had much larger budgets but continued Gilliam's style of "handmade" illusions and trompe l'oeil magic. His filmography is a good argument for the claim that Computer Generated Imagery has effectively robbed special effects of their magic appeal. Everything in Gilliam's later The Imaginarium of Doctor Parnassus is pixel-perfect CGI work. But because almost anything can now be visualized, the illusions just sit there looking woefully "unspecial". 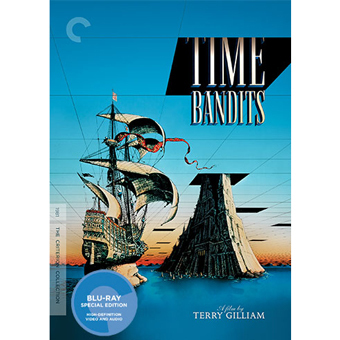 The Criterion Collection's Blu-ray of Time Bandits is a beauty. The image is greatly improved over earlier transfers, looking sharper and with more differentiated colors. Criterion's clean-up takes away some of the rough edges visible in earlier transfers, and the stereo soundtrack is clear (and loud). The extras combine old and new content. An undated feature commentary gives its age away with a reference to a new laserdisc edition. But for entertaining and informative content it can't be bettered. The participants are director Gilliam, David Warner and former child actor Craig Warnock, and briefer input from John Cleese and Michael Palin. We learn a lot about Gilliam's relatively inexpensive special effects solutions, the marvelous dwarf actors and executive producer George Harrison. We also get an interview piece in which Gilliam's designers explain more about their clever techniques, a conversation between Gilliam and Peter von Bagh from 1998, and Shelly Duvall's appearance on a TV talk show with Tom Snyder. A photo gallery and an original trailer winds things up. An appropriate touch is Criterion's Lenticular '3-D' cover of the film's main advertising art. This is another Criterion disc with a folding insert instead of a booklet. This one has a reproduction of the Map of the Universe on one side, and an essay by David Sterritt on the other. George Harrison's song "Dream Away" is heard at the finale. I can't wait to play just the end credits audio for my adult children at Christmas, to see if they remember it. When they were little kids, they danced around the living room every time it came on. Supplements: Audio commentary featuring Gilliam, cowriter-actor Michael Palin, and actors John Cleese, David Warner, and Craig Warnock; New piece featuring production designer Milly Burns and costume designer James Acheson; Conversation between Gilliam and film scholar Peter von Bagh; Shelley Duvall on Tom Snyder's Tomorrow show from 1981; Gallery of photographs; Trailer; foldout with essay by critic David Sterritt.